A range of delicate winter accessories were on display in the VIP room. Fine-crafted leather bag & accessories collections from the renowned Italian brand Cromia. Stylist showed different ways of tying a scarf. Scarves can be styled in multiple ways while keeping one warm. 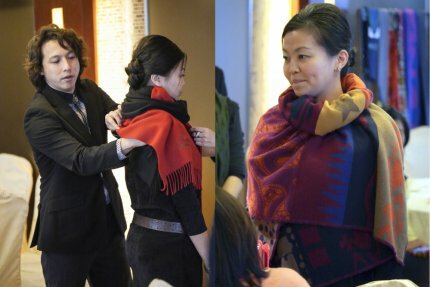 Guests mastered the different ways of tying a scarf in a very short period of time. By selecting chic and unique handbags, one can create a look that suits individual taste. 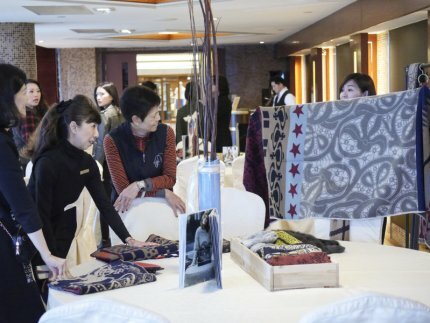 On a sunny 10th January at The Clearwater Bay Golf & Country Club, moda SHU invited a group of guests to participate in a Scarf Workshop which was held exclusively for selected Club members. A range of beautiful and high quality scarves and ties from various renowned brands including Vivienne Westwood, Christian Lacroix, Jimmy Choo and Kenzo were on display in the VIP room which caught the attention of all guests. From the styling advice of moda SHU’s experienced stylist and the demonstration of different ways of tying by the models, guests realized the flexibility of scarves in helping to change an ordinary look to an unique look with personality. After the demonstration, guests were keen to practice what they just learned and started to select their favourite scarves to create their own styles. Together with the fine-crafted leather collections from the renowned Italian brand Cromia, guests were able to effortlessly create a brand new look simply with the multi-wear scarves and quality bags.